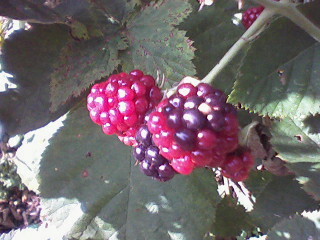 We finally made it down to the berry fields at Restoration Farm for blackberry season and boy am I glad we did! The little guy picked and popped the berries directly into his mouth (“Oh Mom, these are so good! Try this one!) and ran up and down the rows and climbed up and down the compost pile, while I picked the juiciest and blackest berries and dropped them into my paper bag, and chatted with Donna “The Chicken Lady/Social Commentarist” in the cooling breeze of the late afternoon. One of my favorite things about going to the farm and volunteering my labor (which I don’t do as much as I should once the summer kicks in) is talking while you work. The folks at the farm are so interesting and warm and funny, and weeding occupies the hands, while it frees the mind to wander and the ears to listen and the mouth to chat. 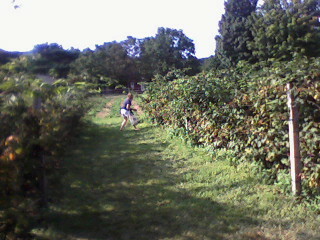 Allison — our long-time CSA partner — picks her berries. Berry-picking does much the same thing. Once you soften your touch to only take the berries which fall off into your hand with the gentlest of tugs — if you tug at all — you find a rhythm as old as time and the conversation comes easily. So does silence. Taking with my not-particularly-smart-but-loyal phone. Not such a bad shot, no? For someone like me, who always has to be getting something done, it is a great relief to be able to have my hands occupied in dignified work, while sharing with friends. I also learn a lot about what to do in my own garden when nothing is going right. And the little man identifies the birds: swallows and mockingbirds and the occasional red-tailed hawk wanting a go at Donna’s chickens. The hawks cause quite a bit of excitement in Mr. Mini-Audubon. And the chickens, of course, who scurry under the coop. Treat these berries gently and use them immediately! So, we collected just under a quart of warm, sweet, soft berries that needed using immediately. Since back-to-school is right around the corner, my fill-the-freezer-frenzy has begun. Mini-muffins make for a perfect lunchbox snack, so that is where I went. I found a terrific and adaptable little recipe at Simply Recipes, where Elise Bauer has some great stuff going on! I made some changes — primarily using stone-ground flour (why not, as the blackberry seeds already give some crunch so the crunchy flour bits pass unnoticed) and adding two tablespoons of blackberry jam to really up the fruit flavor. I generally add berry jam to all berry muffin recipes and I recommend you try it at least once, especially when using frozen fruit out of season. See below for my version and thanks to Elise for the original recipe. My son baked with me and we ate some and froze the rest. It makes a LOT! Position racks in center of oven. Preheat oven to 400°F. Grease (or line with paper cups) 48 mini-muffin cups AND be prepared to have enough batter for another six standard muffins. This makes a lot of batter! Whisk together the flour, baking powder, baking soda, cinnamon and salt in a large bowl. In a separate bowl, whisk together eggs, sour cream, milk, sugar, butter and vanilla. Add the wet mixture to the dry mixture and mix together with a few light strokes, just until the dry ingredients are moistened. Stir in the jam. Add the berries. 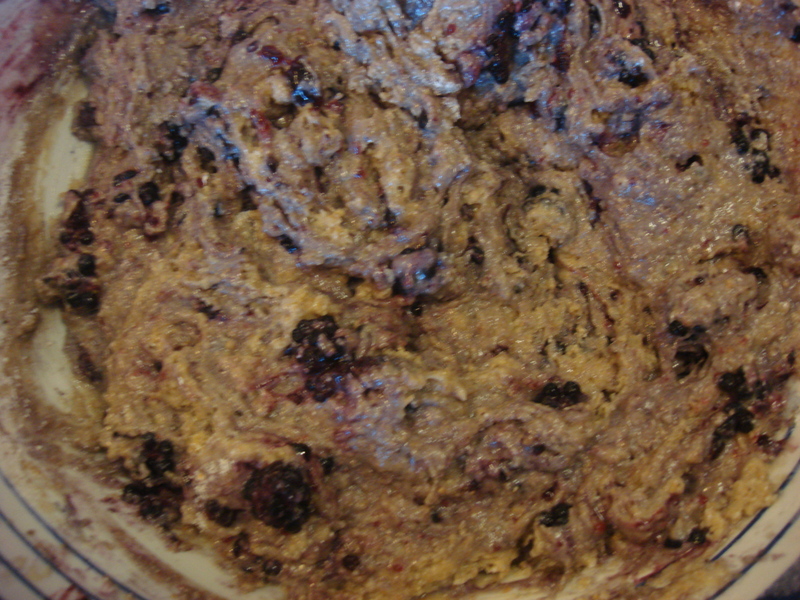 (If you are using frozen berries, defrost them first, then drain the excess liquid, then coat them lightly in flour.) Do not overmix! 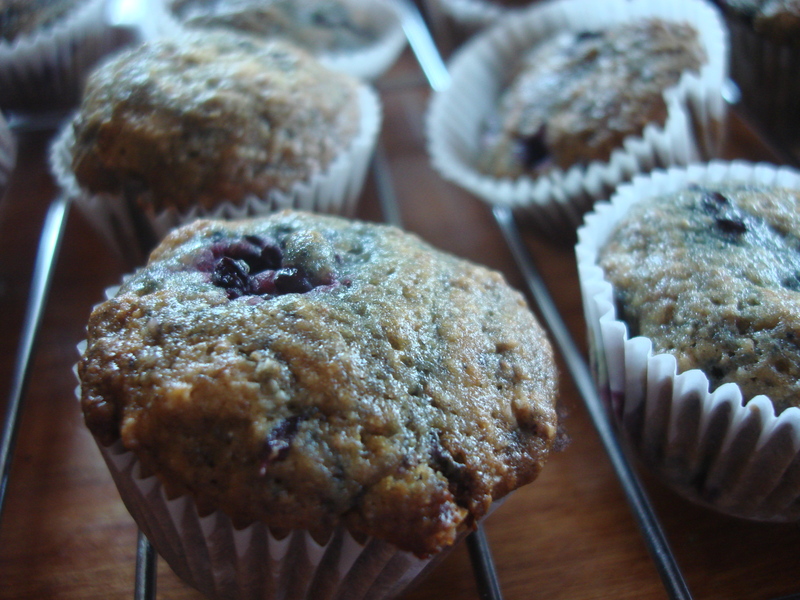 Overmixing will cause the muffins to be dense, not fluffy. The batter should not be smooth. Divide the batter evenly among the muffin cups, filling about 2/3 of the way up. Bake until a toothpick inserted into the middle of 1 or 2 of the muffins comes out clean, 12-14 minutes for mini-muffins and 17-20 for standard muffins (or longer). Let cool for 2 to 3 minutes before removing from the pan. If not serving hot, let cool on a rack. Yield: Makes about 18 standard muffins/48-plus mini-muffins. 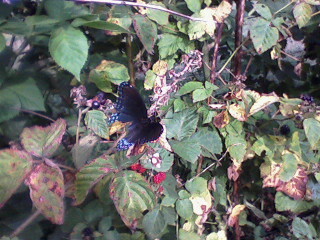 Apparently you spotted me buying those blackberries just the other day! It’s those eyes on the back of my head…. 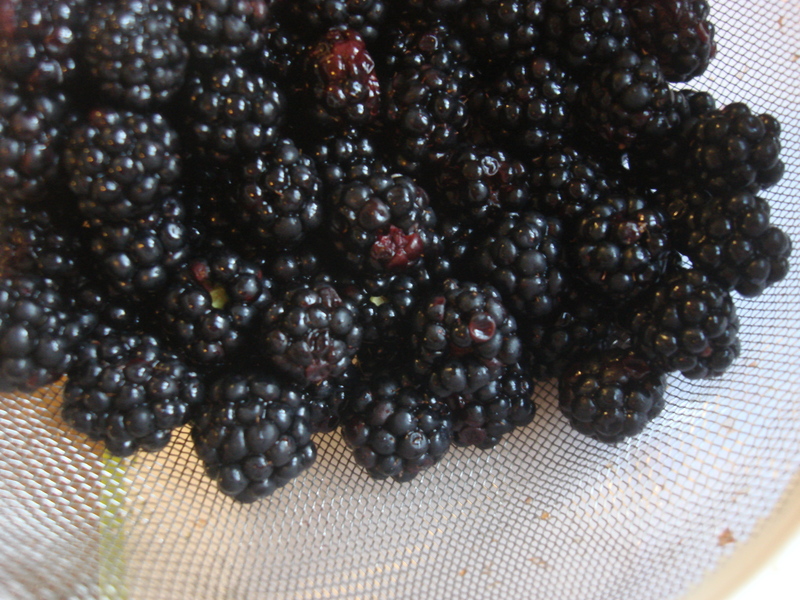 I picked and cooked some blackberries a week ago, but I get terribly uninspired by sweet things – doh! Could you do some sort of glaze for duck or game with it?